Internal directories use the Crowd database to store user, group and role information. Internal directories are stored in Crowd's database server. This will display the Directory Browser. In the left-hand menu, click Add directory. Select internal as the directory type and click Next. Click the Continue button to configure the directory's permissions. Once you have configured the directory's permissions, you will have finished configuring your new directory. You can then map the directory to appropriate applications. The name used to identify the directory within Crowd. This is useful when there are multiple directories configured, e.g. Chicago Employees or Web Customers. Details about this specific directory. Leave blank to disable this feature. Password Complexity Message A message shown when a user is resetting a password to explain custom complexity requirements set with Password Regex (since Crowd 2.5.2). The maximum number of invalid password attempts before the authenticating account will be locked. Enter 0 to disable this feature. The number of days until the password must be changed. This value is in days, enter 0 to disable this feature. The number of previous passwords to prevent the user from using. Enter 0 to disable this feature. 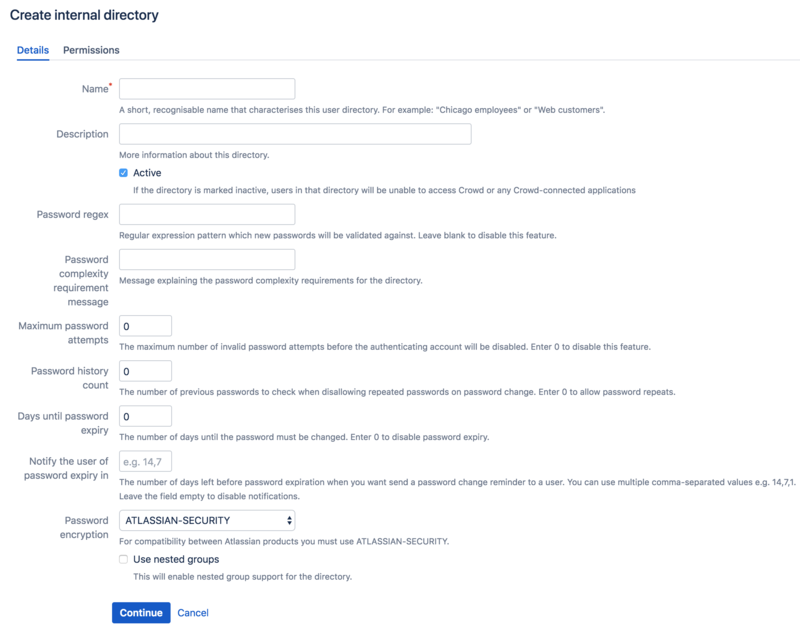 If you wish to import users into this directory from another Atlassian product, specify 'ATLASSIAN-SECURITY' in order to ensure password compatibility. Enable or disable support for nested groups on the internal user directory.